Our school has been following the system of Continuous Assessment for more than two decades now and we are more than happy that the Central Board of Secondary Education has introduced the system, emphasizing on formative assessments that focus on multiple intelligences. It is an all-inclusive system, where every child is given the opportunity to showcase his/her talent to identify innate strengths. In tune with this, one of our objectives is students’ 100 per cent participation in co-curricular activities. Such participation provides opportunities to all students, in turn, recognizing their individual potential and area of strength rather than including a select few and excluding the other inhibited ones. In the course of a year, every child gets an opportunity to speak during the assembly, read out the thought for the day, news, and participate in the school anniversary programme, a mega theatre production. 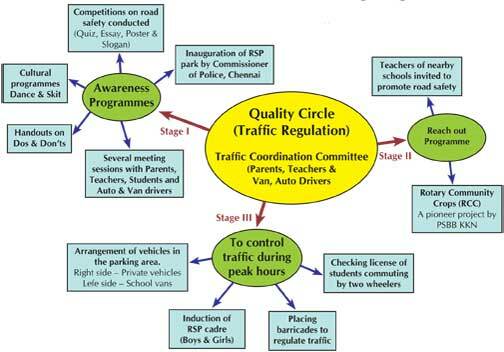 Closely related to this, is yet another concept, Quality Circles (QC), which we have adopted voluntarily. QCs have been started after an initial survey of key areas that need to be constantly monitored in order to sustain and further improve. Teachers and students, on a collaborative platform, work together on discipline, hygiene, social skills, spoken english, reducing the weight of the school bag, furniture maintenance, and traffic regulation in the school zone. I would like to dwell at length on traffic regulation, for in a school that caters to nearly 5,000 students or more, managing traffic at peak hours is indeed a herculean task. Serious deliberations on how to help students reach school led us to a solution. Traffic jams during school hours and near the school was a problem that needed immediate attention. We had meetings to formulate a course of action to regulate traffic on the roads leading to school. Our primary aim was to create awareness among students about road safety measures and its implications. The Quality Circle method was adopted to solve this problem. The initiatives and measures taken during the last few months are displayed graphically for the reader to assess the effort and subsequently the desired outcomes. The harmonious coordination among parents, teachers, and students reaped rich dividends in regulating traffic in front of our school, thereby helping both students and commuters to an appreciable level. Yet another very popular practice in our schools is the participation of parents in the teaching/learning process. Parents are invited once a year to attend school for an entire day to get the feel of the teaching- learning process. I must say that this is most looked forward to by both the parents and the young learners. At times, this opportunity even inspires the parents to join the school as teaching staff. Padma Seshadri Bala Bhavan provides a platform for students to take education with its global dimensions beyond tomorrow. Our international projects like the International School Award, Global School Partnership and Global Young Leaders’ Conference help our students grow into ethical global citizens in a world that has shrunk phenomenally. True to the conviction of Dr. (Mrs) YG Parthasarathy, Dean & Director, PSBB Group of Schools, our students adapt themselves to the changing trends of the progressive world while staying true to their roots, thus making the best of both worlds.